Orested&#39;s Apparatus for Physics Lab To show the action of electric current on a magnet. Magnetic needle 75 mm long with brass bearing supported by pivot mounted on a plastic base &amp; surrounded by a rectangular copper rod fitted with terminals. Dimensions 80 x 40 mm..
We are leading manufacturers, suppliers & exporters of Orested's Apparatus for Physics Lab. 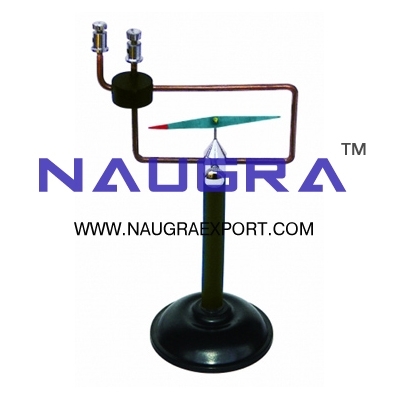 Contact us to get high quality designed Orested's Apparatus for Physics Lab for schools, colleges, universities, research labs, laboratories and various industries. We accept bulk orders for government tenders in all countries around the globe.